race RSVP set includes mulberry and yellow tamarind rsvp card (you print 4 on an 8.5x11 or we print and cut for you) with Milkweed 100% postconsumer recycled paper envelope (heavy 70 pound and handsome) with matching tamarind tissue envelope liner. (you assemble - glue stick included). Rich, handsome and easy! Grace Eco DIY Wedding Invitations. A strikingly lovely wedding invitation for a Green, Seaside or Garden Wedding party. DIY Invitation with skeleton leaf and raffia tie - tree free & post-consumer recycled papers. PAPER FACTS: Wrapper made from treefree mulberry paper from Thailand. Invitation sheet is tamarind leaves and mulberry from Thailand, also treefree. The backing card and envelopes are 100% postconsumer recycled paper, made in the USA. Assembly: medium but a number of steps involved. Envelope: Milkweed 100% post consumer 70 lb. A7 envelope (very handsome) with matching mulberry and tamarind tissue envelope liner (assembly required). Colors: Complex soft white (ivory overtones) paper, subtle yellow leaves,and green grass inclusions. Invitation Card:Natural tamarind leaves and mulberry. Pressed Flower:real rubber tree skeleton leaf. 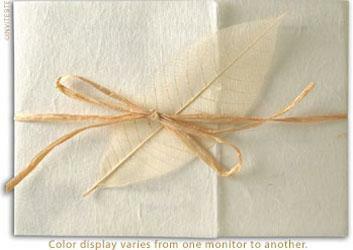 Envelope Liner:Light yellow and grass in soft white mulberry paper. Printing templates in MS Word if you plan to print these yourself.